The Relocating Innovation project, completed in 2011, was a research project with Lucy Suchman and Endre Dányi at Centre for Science Studies, Lancaster University. It reconceptualised innovation through a comparison of three different sites of social, technological and political invention: an internationally recognised centre of technology in Silicon Valley, USA; small-scale high-tech industry on the remote Orkney Islands, Scotland; and the centre of democratic politics in Hungary. 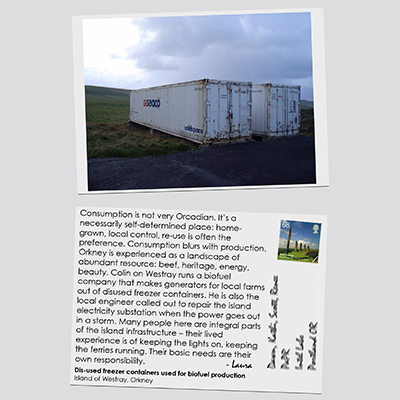 My fieldsite, during this project, was made through a two year ethnography of how the future is imagined and made in the archipelago of Orkney, Scotland. Here, the landscape is filled with 5000 years of technological invention, from the Ring of Brodgar stone circle to the marine renewable energy test site of the European Marine Energy Centre. As part of the project, we collaborated on a set of postcards that we used to bring our three research fieldsites together. We categorised these postcards into different themes, and used them as the basis for exploring the connections and dissonances between our sites of innovation. The website for the complete project, Relocating Innovation, with all our publications and materials is still online here. You can download the postcards here.